Caister Kebab & Pizza House in Caister-on-Sea near Great Yarmouth sells great takeaway food, perfect after a night on the town or just as a treat. On arrival in Great Yarmouth follow signs for the A149 towards Caister-on-Sea, proceeding straight ahead at the roundabout just past Yarmouth Stadium. 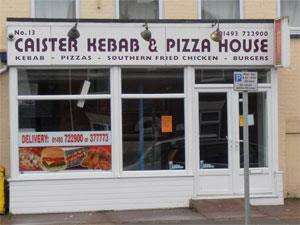 Caister Kebab & Pizza House is located on Yarmouth Road at the row of shops just prior to the next mini roundabout at the junction with Tan Lane.